Richmond Castle is exceptionally impressive, towering at over 300 ft, it is also one of Britain’s oldest stone keeps. There has been one on this site since 1088 . Richmond was granted to Alan the Red, Count of Brittany in 1071. Alan was a relation of William the Conqueror, a second cousin. His father was Count Odo of Brittany. He was part of Duke William of Normandy’s household and was at the Battle of Hastings commanding the Breton contingent. As a consequence, Alan was an extremely rich and powerful man – a position that he improved upon when he helped to quell the rebellion in the North in 1069. Click on the image of Richmond Castle to open a new page listing all of Alan’s lands in the Domesday Book. He founded St Mary’s Abbey in York. His power base was the north and his building work demonstrates how important it was for him to make his mark upon the landscape. He also built the first castle at Middleham which was in the hands of his brother. By the time of his death he was the fourth largest landowner in England. His ambitions included marriage to the King of Scotland’s daughter Edith also known as Matilda. William the Conqueror saw this as a step too far but somehow or other Alan had become entangled with another royal lady during this time. Edith was living at the nunnery of Wilton. It appears that King Harold’s daughter Gunnhild was living there as well. She may well have been sent there for her education as well as her own protection. Alan’s plans for Edith fell through but apparently Gunnhild took herself off to Richmond to be with Alan. Seems straight forward? Well, it would be if there was only one source involved – did she go willingly or was she abducted? Was she a nun or was she simply living in a nunnery as many well-born women did? Was it love or was it a match between a Saxon and a Norman to secure for Alan the lands that came to Gunnhild via her mother (Edith Swanneck)? If the latter was the case, then Alan was seeking to secure some of his lands not just by conquest but also by union with the woman whose lands they rightfully were. When Alan died in 1093, shortly after he carried off Gunnhild, his estates went first to his brother, the imaginatively named, Alan the Black and then to their younger brother Stephen. As for Gunnhild, having eloped from her nunnery, she was in no hurry to return so she took up with Alan the Black and earned a stinging rebuke from Archbishop Anselm. There is also the intriguing possibility that the dates given above are not the correct ones and that the correct story occurs much earlier. She and Alan eloped in the 1070s rather than just before Alan’s death. This isn’t as far-fetched as it seems. After all there are different accounts as to when he died – one gives the date as 1089 when he was very much alive. If the dates for the match are earlier then it is possible that the couple had a daughter called Matilda who was married to Walter d’Agincourt. Matilda gave large gifts of land at the time of her marriage to Lincoln Cathedral – these were all the property of Alan the Red. This version would, perhaps, also account for the seemingly dramatic swapping of one Alan for another. Gunnhild is a chance discovery when I was researching Alan the Red to find out more about the man who built Richmond Castle. She’s sitting on the margins of history and once again the moth-holed accounts are tantalizingly incomplete. edited by Stephen Morillo, William North. This can be accessed via Google Books and makes for fascinating reading. This entry was posted in Castles, Eleventh Century and tagged Alan Niger, Alan of Brittany, Alan Rufus, Alan the Black, Alan the Red, Domesday Book, Edith Swanneck, Gunnhild, Middleham Castle, Richmond Castle, St Mary's Abbey York, William the Conqueror by JuliaH. Bookmark the permalink. Another fascinating chunk of history!! Keep th coming! It’s not accurate to say concerning Ribald’s descendants that “the family line ended” just because the Y chromosome wasn’t passed down in that direction any more. The Bretons didn’t think in a strictly patrilineal fashion: they did (and do) self-identify as Celts and have never been bound by the Salic Law of the Franks, so a Breton daughter could legitimately supplant a son as heir, as was the case with Duchess Bertha. For example, Richard Neville, known as Warwick the Kingmaker, regarded his most important line of descent as being not Neville, but that of the Breton House of Rennes (Alan Rufus’s family), despite his descent from Ribald, and also from the above-mentioned Matilda, being through daughters of “the family line [that] ended”. By his bloodline (not Y-chromosome-line) from Ribald, he inherited Middleham Castle. The other emblem in the first quarter of Warwick’s coat of arms was that of his wife’s Beauchamp family, from which he “inherited” the Earldom of Warwick. So, in the mind of the Bretons and their descendants, female connections by descent (or even by marriage alone) were always sufficient to account one a member and heir of a family. “The religious houses of Yorkshire” (1853) by George Lawton, and “The Peerage of England, Or A Genealogical and Historical Account of All the Peers of England Now Existing …” (January 1735) by Arthur Collins, both quote Orderic Vitalis (1075 – c. 1142) concerning Count Alan Rufus: “He was ever studious for peace, a great lover of the poor, and an especial honorer of the religious; his death without issue occasioned no little sadness to the people”. A couple of refinements of statements in the article: firstly, Count Alan was a double second cousin of King William: they shared 4 out of 8 great grandparents, as their fathers Eozen and Robert were double cousins (almost brothers, genetically). Secondly, the Domesday book records Alan 1017 times, as either Lord or Tenant-in-Chief; only King William and Count Robert of Mortain (a half-brother of William) held more manors. Although the “Land of Count Alan” was in Yorkshire, most of Alan’s possessions were in East Anglia (Essex, Cambridgeshire, Suffolk, Norfolk, Lincolnshire). Alan also had holdings in the City and Port of London, but the Domesday book didn’t survey London. However, most of the early Mayors of London were Bretons, which shows his lasting influence there. Although the site http://www.durhamworldheritagesite.com/history/normans/william-conquest/king-of-england asserts that “[Alan Rufus] led the ‘Harrying of the North'”, in which, as Orderic Vitalis states with great distress, over 100,000 people perished, I find it difficult to reconcile the website’s claim with Orderic’s high assessment of Alan, or with Alan’s subsequent excellent relations with the many Anglo-Dane lords whom he reinstated after William deposed them. I’ve read another view: that William sent his half-brother Bishop Odo of Bayeux to conduct the Harrying. While Alan was conducting diplomacy, Odo was laying Yorkshire waste. Alan was informed, collected his troops and returned south to confront Odo and put a stop to the devastation. Alan then earnestly requested an audience with William, whom Alan surprised by surrounding William and his bodyguard. Alan demanded that the wastelands be conceded to him as the “Lands of Count Alan”, so that no-one could harm the people there again. Alan got his way and Odo received no land in Yorkshire. Alan was the pre-eminent knight of the 11th century: his presence at the three-year siege of Saint Suzanne drew a flood of challengers from across Europe. Alan and Gunnhild may be the inspiration for Lancelot and Guinevere. The first mention of Lancelot occurs in the next century by writers personally acquainted with Alan’s family. In the Arthurian tales that followed, Camelot was associated with a variety of places across Britain, but either Alan or his brother Brian had extensive estates in all of them (the South-West, East Anglia, the Scottish Borders, Richmond castle). Alan left his command at the siege of Sainte Suzanne after one year (in about 1084 or 1085), presumably in time to participate in the King’s Council meeting (of Christmas 1085) to prepare for the Domesday Survey. Bishop Odo had been deposed as Earl of Kent in 1082, leaving Count Robert of Mortain and Count Alan of Brittany as the most important magnates: Robert in the centre, south and west of England, and Alan in the East and North (from the Thames to the Scottish border). Evidently, the first trial for the survey was a detailed investigation of Cambridgeshire (the “Inquisitio Comitatus Cantabrigiensis” or “Cambridge Inquisition”); the commissioners then proceeded to Essex, Suffolk and Norfolk (“Little Domesday”); a less comprehensive survey of the rest of England (“Great Domesday”) was then begun in Yorkshire. In all of these shires, Alan was the largest landholder (after the King), and these counties were examined in the same order in which Alan had acquired land. The Domesday Book contains the King’s Commissioners’ concerns about land that was wrongly acquired by various lords, and Alan’s considered opinion of his land dispute with Aubrey de Vere. There’s some evidence that the compilation of the Domesday Book may have been completed during the reign of William II (1087-1100). Count Robert was deposed in 1088, so Alan was the most senior political constant through the whole process. Breton aristocrats were known for their attention to detail and interests in finance and education. Taken together, this body of evidence suggests that Alan may have been the guiding force behind the whole Domesday project. Wagner’s “Parsifal” is based on the adventures of Sir Perceval. 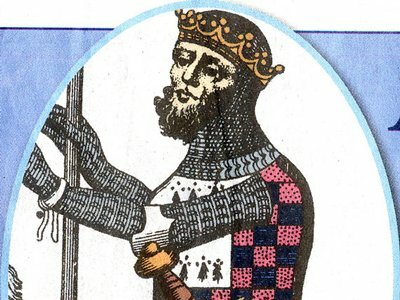 Since the Perceval family claim descent from a brother of Alan’s named Robert (who was so described among the witnesses to a charter), we have yet another Arthurian connection to Alan’s family. Matilda d’Aincourt was probably Alan’s sister. According to one account, she married Walter d’Aincourt in Bourn, Cambridgeshire in 1065 (sic). Walter was at the time the lord of Derby under King Edward the Confessor. Circumstantial evidence for this is that when Alan obtained many of Edeva the Fair’s (Edith Swannesha’s) properties in Cambridgeshire, he promoted Almer lord of Bourn. Furthermore, since the Normans and Bretons did not recognise Harold’s title as King, his descendants would at most have been considered high-ranking aristocrats. Speaking of Derby, Derbyshire was a source of salt, which was shipped down the Trent to the port of Boston, which also exported wool. Alan promoted Boston with a trade fair on his own land, and by 1204 it had grown to be England’s second port, only a little behind London in revenues. Like several other east coast ports in England, Boston was admitted into teh Hanseatic League. Unless the data has not been fully entered, the Domesday Book (domesdaymap.co.uk) seems to report that Alan did not charge rent at Boston, despite the richness of the town and the ample taxes it paid to the King. The implication would be that Alan was one of the major traders in the town, and he realised that he would benefit most by making Boston ever more prosperous. Boston, Massachusetts recalls Alan in many ways: it was named after his port city of Boston in Lincolnshire, all the counties around it are named after ones where he was a major landowner (Middlesex, Essex, Suffolk, Norfolk), and Cambridge was also one of his towns. Moreover, Harvard was founded by academics from the University of Cambridge, the coat of arms of which bears a large ermine cross, in honour of Brittany, Alan’s homeland. There’s also a Winthrop connection which I’m investigating. Upon further consideration, Trevor Foulds’s suggestion that Matilda d’Aincourt was a daughter of William the Conqueror seems the most likely explanation. In Domesday and a couple of other contemporary documents, there’s mention of “Matilda, the King’s daughter”. Now, the d’Aincourt sons were named William, Ralph and Walter, exactly what we’d expect if the mother were Princess Matilda. There’s no use of “Alan” or “Gunhilda” (or “Harold” or “Gytha”, or Alan’s parents names “Eudes” and “Agnes”) in that or any subsequent d’Aincourt generation. Why then did Matilda donate land belong to Alan? Richard Sharpe may have stated the answer when he mentioned that several people outside Alan’s family had been so enabled. In Matilda’s case, there were two important connections with Alan: one political, the other commercial. According to the Register of the Honour of Richmond, it was Queen Matilda who persuaded King William to transfer Earl Edwin’s lands to Alan, so Alan would naturally be well-disposed to her daughter Matilda. Furthermore, Matilda’s husband was an important trade partner of Alan’s: for example, the lead mined on Walter’s land was shipped via Lincoln to Alan’s port of Boston for export. The army William II sent to deal with the Bishop of Durham in 1088 was led by Alan, Odo of Champagne and Roger of Poitou, with Walter d’Aincourt entrusted with the royal writ requiring the return of stolen cattle. Alan was a (double-second) cousin of the Conqueror, Odo of Champage was the third husband of Adelaide the Countess of Aumale (the Conqueror’s sister), and Roger of Poitou was a son of Roger of Montgomery, a distant relative and long-time confidante of William I. So the army’s commanders consisted of relatives and in-laws of the King. One family that did have both Alans and Gunhildas in it was that of Earl Gospatric of Cumbria, Bernicia and Northumberland (deposed by King William in 1072). He had sons named Gospatric and Waltheof, a daughter and a grand-daughter named Gunhildr, a grandson named Alan (of Allerdale), and a great-great-grandson named Alan (of Galloway). Of the four Englishmen who survived to be major landowners during the Domesday survey of 1086, two were tenants of Alan’s in Yorkshire, and one of these was named Gospatric the Thegn. Conceivably this may have been the son of the Earl. So it may be that Gospatric’s family were showing their gratitude. Correction: Derbysire supplied lead to Boston, not salt. The salt was of course produced close to the shore. In the latter 1080s, at Alan’s request, William the Conqueror came up to York to refound St Olave’s Church – and to publicly apologise for the destruction caused by his armies years before. A consequence of Alan choosing the winning side in the Rebellion of 1088 is that he acquired lands from many of the defeated barons. By war’s end, he was both witnessing and issuing charters at Rochester in Kent: Bishop Odo’s capital. Some of his family then settled in Kent, which suggests that Alan filled the vacuum left by Odo’s permanent exile. At this stage, Alan was, as his epitaph states, “shining, second to the King”. Much of the aforegoing I believe to be guesswork, supposition and propaganda. All that we know for certain is that one of the cruellest most sadistic killers of this period, known rightfully as William the Usurper was before his pitiably late death, responsible for numerous acts of savage genocide. Orderic Vitalis reminds us of the Usurper’s death bed repentance: “I have persecuted the English beyond all reason. Whether gentle or simple I have cruelly oppressed them; many I unjustly disinherited; innumerable multitudes perished thru’ me by famine or the sword; I fell upon the English of the Northern shire like a ravening lion. I commanded their houses and corn, with all their implements and chattels to be destroyed without distinction and great herds of cattle and beasts of burden to be slaughtered wherever they were found. Yes, John, King William was reported by Orderic to have made that deathbed confession in September 1087. But few genocidal rulers ever express regret. The evidence is that Alan had been pressing him for years to recognise how horrible his crimes were. William did go to York to say sorry, he did refound St Olav’s as partial recompense, and I think Alan was at William’s deathbed until sent with William II to England, immediately after which Robert of Mortain used the opportunity to attain the release of his notorious brother Odo of Bayeux. Odo was the leading culprit in the implementation of the two Harryings of the North in 1069/70 and 1080. In Jan/Feb 1088, William II brought the royal court to York to officially “found” St Nary’s Abbey, which Alan was the “constructor” of. Almost immediately, Odo began conspiring with the majority of Norman magnates to replace William with his pliable elder brother Robert “Curthose”, the new Duke of Normandy. Orderic attributes this rebellion to the barons not wanting to be beholden to two rulers, but this had never bothered the Bretons. That Alan led the defence and was supported by the church and the English Fyrd, indicates another motive: opposition to Alan and his policies of reconciliation. Earl Morcar lost his lands due to the rebellion of 1068. Alan acquired Morcar’s North Yorkshire properties. I believe this is also when he received Edwin’s. A probable date is for the transfer is early 1069. Queen Matilda had travelled to Yorkshire during 1068 where she gave birth to Henry. The Register of the Honour of Richmond honours her as the one who persuaded her husband to grant Edwin’s lands there to Alan, so the dates agree. This was many months before the Harrying, which means that many of the lands devastated were already Alan’s. He therefore suffered great loss of tenants and property values due to it, and therefore would have been insane to have participated in it. Was Alan insane? All records are that he was calm, cool and collected under stress: the report of court proceedings against William de St Calais in September 1088 makes this explicit: not only was Alan the only one keeping his head, he calmly defended his colleagues and the legal rights of St Calais, confronted the King and refused to comply with illegal orders. In the end, it was the king who backed down. So how did Alan treat his tenants? Aside from the proof in Domesday that he promoted the English and excluded Normans, he abolished the onerous Danegeld, refused entry to Royal sheriffs, giving their authority to local jurists instead. Moreover, there is a series of legal documents from the Norman to the Stuart era in which the crown acknowledged that soon after 1066 Alan had obtained the concession from the Crown that all of his tenants and employees had free passage throughout England: they did not pay customs, tolls, or any other transit charges. The most recent occasion on which I have found this right accepted was in 1641 under Charles I, in the course of discussion about what other extraordinary privileges those under the Honour of Richmond held. So Alan looked after his tenants to a degree and with a boldness that no one else did, and his successors made sure these rights were not forgotten. Incidentally, relations between Alan and William’s half-brothers must have been quite complex. Robert and Odo are recorded about 1050 as witnesses to a charter by Alan’s father Odo of Penthievre to Landevennec Abbey in western Brittany. The charter makes clear that Robert was the older brother. This raises the possibility that the brothers were named after Duke Robert of Normandy and his double-cousin Count Odo, at the time Duke Regent of Brittany, despite having no known _blood_ relationship to either. Some say they had a sister with the very Breton name of Muriel. How did this come about? Their father was Herluin de Conteville. Herluin is the name of a Count of Ponthieu (in the Somme) in the early 900s who received the fleeing monks of Landevennec Abbey, after a Viking invasion of Brittany. The Roman general Magnus Maximus brought large numbers of troops from Britain in 383 to the northern parts of Gaul, from what became Brittany to the Somme, while he invaded via the Rhine. Just perhaps, Herluin may have descended from these early British migrants. Since Alan had obtained the concession from William I that all tenants and “men” (employees) of the Honour of Brittany/Richmond were exempt from tolls, customs excise, and all other transit charges throughout England, a privilege that still stood under Charles I in 1641, I wonder whether St Mary’s Abbey, although under royal patronage since February 1088, may have shared this right? Ribald might, perhaps, be composed of these two elements: Ri, which is Breton for King, and the Germanic word Bald. Charles the Bald, King of the West Franks and later Emperor of all the Franks, was consistently defeated by Breton Dukes, but diplomatic marriages led to him becoming an ancestor of later Dukes, and thus of Alan and Ribald.